The Department of Transportation (DOTr) on Thursday officially launched the country’s first “Palamigan ng Bayan,” a refrigerated container van, located at the Tagbilaran City pier as part of efforts to improve the distribution system of perishable goods particularly fish in the province. DOTr Secretary Arthur Tugade led the opening ceremony together with Undersecretary for Aviation and Airports Manuel Antonio Tamayo, Assistant Secretary for Maritime Fernando Juan Perez, Philippine Ports Authority (PPA) General Manager Jay Santiago and Tagbilaran Port Manager James Gantalao. According to Gantalao, the 40-foot reefer container van will be used as cold storage to keep perishable goods such fish and meat fresh after these are shipped to the Tagbilaran City pier from various provinces and before these are distributed across Bohol. “Gi-promote ni ni Sec. Tugade in support sa atong Department of Agriculture [DA] para sa supply sa atong mga isda, karne or any perishable items. So ang MARINA [Maritime Industry Authority], PPA, DOTr naghimo ani para ang mga incoming na perishable goods labina ang isda naa’y kabutangan,” he said. Gantalao said that the government reefer container van is the first of its kind that will support the DA’s transportation of perishable goods across the country, noting that the same measure will be implemented in other provinces. “Dili lang ni sa Bohol, whole Philippines ni. Butangan g’yud og ngani depende sa location kung panginahanglanon nila daghan. Depende pud na sa Department of Agriculture asa sila mag-deliver sa ilang mga goods,” he added. Bohol is expected to get five more refrigerated container vans which will be spread across the province’s various ports. “Diri sa Bohol, gi target ni na unom kabuok. Nangutana sila aha na pantalan ang pwede. So sa Ubay pwede kay dako man ang pantalan, naa tay kabutangan. Sa Catagbacan, pwede. Sa Jagna, pwede pud,” Gantalao said. “Kung aha ang nanginahanglan, adto nato ibutang. Mas daghan, mas maayo. 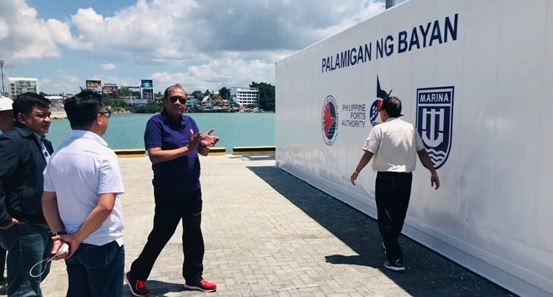 Gantalao noted that various shipping lines have donated reefer container vans which were already decommissioned including the one used for the Palamigan ng Bayan in Bohol. In August, the DA through Sec. Manny Piñol pledged to ship fish supply to Bohol from various areas to help bring down fish prices in the province.